Designed for individuals and groups of five or more students studying abroad or participants of cultural exchange programs. Most plan options are designed to meet the U.S. J1 and J2 visa travel insurance requirements. Be an active participant in a study or exchange program (i.e. student visa, exchange visa, visitor visa), the spouse of the participant, or a dependent traveling with the participant. Reside outside the country of residence for the purpose of pursuing international educational activities for a temporary period of time. Be physically and legally residing in host country with the intent to reside there for at least 30 days on the effective date and at renewal. Not be hospitalized, disabled, or HIV+ on the initial effective date. Whether your trip takes you abroad for a few weeks or a year, your cultural exchange experience should be enjoyable. You have enough to worry about when you're traveling. Don't let your medical coverage be an uncertainty. IMG has developed Patriot Exchange Program to offer a complete package of international benefits available 24 hours a day. Most of the plan options are designed to meet the U.S. visa travel insurance requirements for a student studying abroad or a participant of cultural exchange. The individual and group plans provide coverage for dependents and may be purchased in monthly increments. You can choose from a range of plan maximums and additional add-on coverages. You may also seek treatment with the hospital or doctor of your choice. 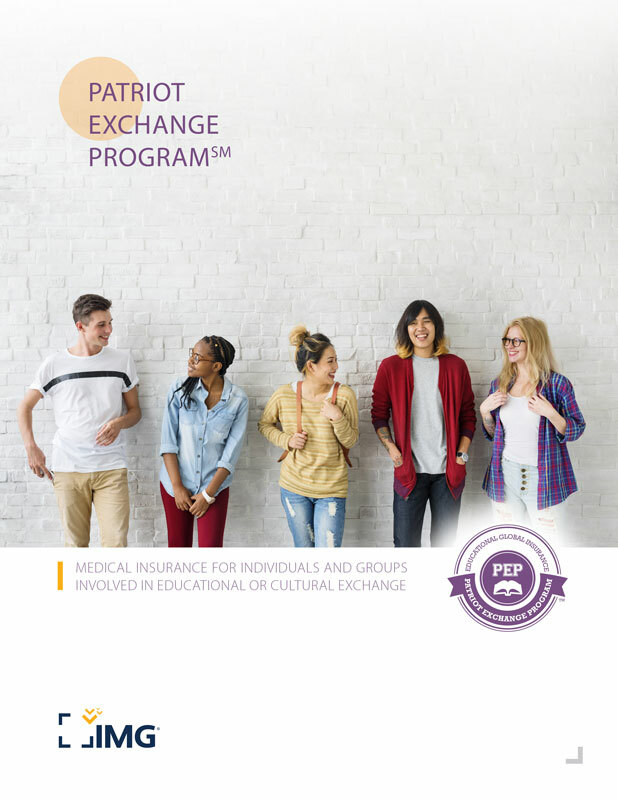 When seeking treatment in the U.S., you have access to the independent Preferred Provider Organization (PPO), a separately organized network of hundreds of thousands of established, highly qualified health care physicians and many well-recognized hospitals in the U.S. contracted by IMG. You can quickly search the network through MyIMG. To help you locate health care providers outside the U.S., IMG provides its online International Provider AccessSM (IPA), a database of over 17,000 providers.